Born: Saumur, France, 19 August 1883. Education: At convent orphanage, Aubazine, 1895-1900; convent school, Moulins, 1900-02. Career: Clerk, Au Sans Pareil hosiery shop, Moulins, 1902-04; café-concert singer, using nickname "Coco," in Moulins and Vichy, 1905-08; lived with Etienne Balsan, Château de Royalieu and in Paris, 1908-09; stage costume designer, 1912-37, established millinery and women's fashion house with sponsorship of Arthur "Boy" Cappel, in Paris, 1913, later on rue Cambon, Paris, 1928; established fashion shops in Deauville, 1913, Biarritz, 1916; fragrance, No. 5, marketed from 1921; film costume designer, 1931-62; headquarters closed during World War II; exiled to Lausanne for affair with Nazi officer, 1945-53; rue Cambon headquarters reopened and first post-war showing, 1954; Broadway musical Coco, starring Katherine Hepburn debuted on Broadway, 1969; company continued after Chanel's death, 1971; ready-to-wear introduced, 1977; Karl Lagerfeld brought in as designer for couture, 1983; Lagerfeld took over ready-to-wear, 1984; gun manufacturer Holland & Holland acquired, 1996; French beachwear company Eres pruchased, 1997; one licensing agreement with Luxxotica for eyewear. Other fragrances include No. 22, 1921, Cuir de Russie, 1924, No. 19, 1970, and from the House of Chanel, Cristalle, 1974, Coco, 1984, Egoïste for men, 1990, Allure, 1996, and Allure Homme, 1998; launch of Precision skincare line, 1999; introduced line of his-and-hers watches, 2000. Exhibitions: Les Grands Couturiers Parisiens 1910-1939, Musée du Costume, Paris, 1965; Fashion: An Anthology, Victoria & Albert Museum, London, 1971; The Tens, Twenties & Thirties, Metropolitan Museum of Art, New York, 1977; Folies de dentelles: Balenciaga, Cardin, Chanel, Dior…Exposition du 24 juin au octobre 2000, Musée des Beaux-Arts et de la dentelle, 2000. Awards: Neiman Marcus award, Dallas, 1957; Sunday Times International Fashion award, London, 1963. Died: 10 January 1971, in Paris. Company Address: 29-31 rue Cambon, 75001 Paris, France. Company Website: www.chanel.com . 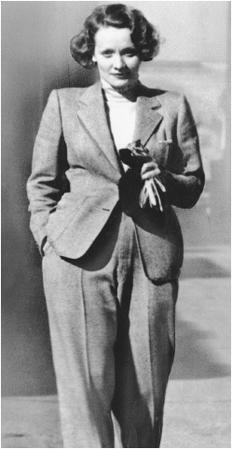 Marlene Dietrich modeling a masculine-styled pant suit designed by Coco Chanel, 1933. Baillen, Claude, Chanel solitaire, Paris, 1971, and London, 1973. Haedrich, Michael, Coco Chanel secréte, Paris, 1971; published as Coco Chanel: Her Life, Her Secrets, Boston, 1972. Galante, Pierre, Les années Chanel, Paris, 1972; published as Made-moiselle Chanel, Chicago, 1973. Charles-Roux, Edmonde, L'irréguliére, ou mon itinéraire Chanel, Paris, 1974; published as Chanel, Her Life, Her World, New York, 1975, London, 1976. Morand, Paul, L'allure de Chanel, Paris, 1976, 1996. Charles-Roux, Edmonde, Chanel and Her World, Paris, 1979, London, 1981. Delay, Claude, Chanel solitaire, Paris, 1983. The Polytechnic, Coco Chanel, Brighton, 1984. Haedrich, Marcel, Coco Chanel, Paris, 1987. Leymarie, Jean, Chanel, New York, 1987. Charles-Roux, Edmonde, Chanel, London, 1989. Kennett, Frances, Coco: The Life and Loves of Gabrielle Chanel, London, 1989. Grumbach, Lilian, Chanel m'a dit, Paris, 1990. Madsen, Axel, Chanel: A Woman of Her Own, New York, 1990. Mackrell, Alice, Coco Chanel, New York, 1992. Ash, Juliet, and Elizabeth Wilson, eds., Chic Thrills: A Fashion Reader, Berkeley, California, 1993. Lagerfeld, Karl, Chanel, Paris, 1995. Baudot, François, Chanel, New York, 1996. Musée des Beaux-Arts et de la dentelle, Folies de dentelles: Balenciaga, Cardin, Chanel, Dior…, [exhibition catalogue], Alençon, 2000. "Gabrielle Chanel," [obituary] in the Times (London), 12 January 1971. "Chanel No. 1," in Time, 25 January 1971. Shaeffer, Claire, "The Comfortable Side of Couture," in Threads (Newtown, Connecticut), June/July 1989. Kazanjian, Dodie, "Chanel Suit," in Vogue, August 1990. Fedii, Daniela, "Coco la ribelle," in Elle (Milan), November 1990. Steele, Valerie, "Chanel in Context," in Juliet Ash and Elizabeth Wilson, eds., Chic Thrills, A Fashion Reader, Berkeley, California 1993. Collins, Amy Fine, "Haute Coco," in Vanity Fair (New York), June 1994. Menkes, Suzy, "Strong Chanel Holds Up Couture's Falling Walls," in the International Herald Tribune, 21 March 1995. "Chanel: The Naughty Professor," in Women's Wear Daily, 21 March 1995. Sakamaki, Sachiko, "Chanel Surfing in Tokyo; Japan is Nuts About the French Brand Name," in the Far Eastern Economic Review, 11 January 1996. ——, "Chanel Goes to the Head of the Class," in the International Herald Tribune, 11 July 2001. Coco Chanel in New York. A woman of ambition and determination, Gabrielle Chanel, nicknamed "Coco," rose from humble beginnings and an unhappy childhood to become one of the 20th century's most prominent couturiers, prevailing for nearly half a century. In contrast to the opulent elegance of the belle époque, Chanel's designs were based on simplicity and elegance. She introduced relaxed dressing, expressing the aspirations of the day's woman, replacing impractical clothing with functional styling. Chanel's early years tended to be vague in detail, being full of inaccuracies and contradictions, due to her deliberate concealment of her deprived childhood. It is generally accepted that Chanel gained some dressmaking and millinery experience prior to working in a hat shop in Deauville, France. Using her skills as a milliner she opened shops in Paris, Deauville, and Biarritz with the financial assistance of a backer. Chanel was an astute businesswoman and skillful publicist, quickly expanding her work to include skirts, jerseys in stockinette jersey, and accessories. Recognized as the designer of the 1920s, Chanel initiated an era of casual dressing, appropriate to the occasion, for relaxed outdoor clothing created to be worn in comfort and without constricting corsets, liberating women with loosely fitting garments. Her style was of uncluttered simplicity, incorporating practical details. In 1916 Chanel introduced jersey, a soft elasticated knit previously only used for undergarments, as the new fashion fabric. Wool jersey produced softer, lighter clothing with uncluttered fluid lines. She made simple jersey dresses in navy and grey, cut to flatter the figure rather than to emphasize and distort the natural body shape. The demand for her new nonconformist designs by the wealthy was so great and the use of jersey so successful Chanel extended her range, creating her own jersey fabric designs, which were manufactured by Rodier. Highly original in her concept of design, Chanel ceaselessly borrowed ideas from the male wardrobe, combining masculine tailoring with women's clothing. Her suits were precise but remain untailored, with flowing lines, retaining considerable individuality and simple elegance. Riding breeches, wide-legged trousers, blazers, and sweaters were all taken and adapted. A major force in introducing and establishing common sense and understated simplicity into womenswear, Chanel's coordination of the cardigan, worn with a classic straight skirt, became a standard combination of wearable separates. 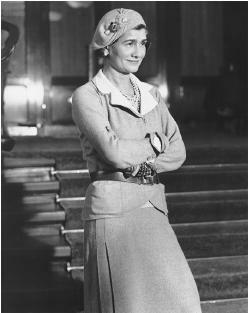 Chanel produced her cardigans in tweed and jersey fabrics, initiating the perennially popular "Chanel suit," which usually consisted of two or three pieces: a cardigan-style jacket, weighted with her trademark gilt chain stitched around the inside hem, a simple easy-to-wear skirt, worn with a blouse (with blouse fabric coordinated with the jacket lining). Her work offered comfort and streamlined simplicity, creating clothes for the modern woman, whom she epitomized herself. The key to her design philosophy was construction, producing traditional classics outliving each season's new fashion trends and apparel. While other designers presented new looks for each new season, Chanel adapted the refined detailing and style lines. Her colors were predominantly grey, navy, and beige, incorporating highlights of a richer and broader palette. Chanel introduced the ever popular "little black dress,"created for daywear, eveningwear, and cocktail dressing which became a firm fixture in the fashion world during her tenure, and is still popular today. Attentive to detail, adding to day and eveningwear, Chanel established a reputation for extensive uses of costume jewelery, with innovative combinations of real and imitation gems, crystal clusters, strings of pearls, and ornate jewelled cuff links, adding brilliant contrast to the stark simplicity of her designs. The successful development of Chanel No. 5 perfume in 1922 assisted in the financing of her couture empire during difficult years. An interesting aspect of Chanel's career was the reopening of her couture house, which was closed during World War II. After 15 years in exile for having an affair with Nazi officer Hans Gunther von Dincklage, Chanel relaunched her work in 1954 at the age of 71, reintroducing the Chanel suit, which formed the basis for many of her collections and become a hallmark. The look adopted shorter skirts and braid trimmed cardigan jackets. Despite her work and individual style, Chanel craved personal and financial independence, and was ruthless in her search for success. She was unique in revolutionizing the fashion industry with dress reform and in promoting the emancipation of women. Her influence touched many American and European designers, who have continued to reinforce her concept of uncomplicated classics. Once such designer is Karl Lagerfeld who took over designing the Chanel couture line in 1983 and its ready-to-wear collections the following year. He is widely credited with bringing Chanel back to the forefront of fashion, by taking original Chanel designs and tweaking them to appeal to younger customers. Throughout the 1990s and into the 2000s Lagerfeld kept the Chanel name alive and well. His collections receive high praise, season after season, and he is among the last of the great old-school designers. As Suzy Menkes of the International Herald Tribune so aptly put it in March 2000, "Lagerfeld will soon be the last of the fashion Mohicans, the tribe that came center stage in ready-to-wear in the 1960s but were schooled in the old couture ways of rigorous cut, perfect execution, invention in detail.… Who in the next generation can ever fill his seven-league boots?" Who indeed? She had almost married one of the richest men in Europe, the Duke of Westminster; when she didn't, her explanation was, "There have been several Duchesses of Westminster. Coco Chanel is attributed with making sun tans popular. Previosly considered to be a sign of the working poor, having to work outside in fields all day, having a tan was frowned upon by the upper class. However, once seen on the fabulous, up-and-coming designer Coco Chanel... well the rich couldn't get their butts to the beach fast enough!! coco chanels work is absoulutly amazing. she obviously has much talent to create such beautiful clothing, and i would love to follow in her footsteps and become a designer.